ASUS introduced the Radeon HD 6770 DirectCU Silent, claiming this is the coolest passively cooled graphics card on the market. The card has a 850MHz core and 1GB GDDR5 clocked at 4000MHz. with the release of the new HD 6770 DirectCU Silent, ASUS has deployed the most powerful and advanced fanless graphics cards available. Running totally silent and 16%* cooler than generic passive designs, the ASUS DirectCU Silent series increases thermal performance and offers consumers a more reliable and longer lasting experience that meets every graphics need, from casual multimedia to dedicated gaming. ASUS thermal engineers have developed exclusive DirectCU cooling technology, integrating direct-contact copper heat pipes that touch the GPU core for faster and more effective heat dissipation, and thus lower temperatures and better performance. Based on these principles, ASUS engineers have created the most effective 0dB silent graphics cards available. DirectCU Silent designs have been applied on the GT 430, GT 440, GTS 450 and HD 6670 previously, and now on the HD 6770 model. Through intricate material processing and intelligent molding, the heatsinks in DirectCU Silent cards offer up to 95%* larger surface area and run around 16%* cooler than conventional passive cards, resulting in more stable performance and longer lasting products. Based on a proprietary alloy mix developed in-house by ASUS, Super Alloy Power involves filling power delivery components with a high endurance compound that can better resist heat. Super Alloy Power components lead to 15%* faster performance, a wider overclocking margin, and products that last 2.5* times longer than generic graphics cards. 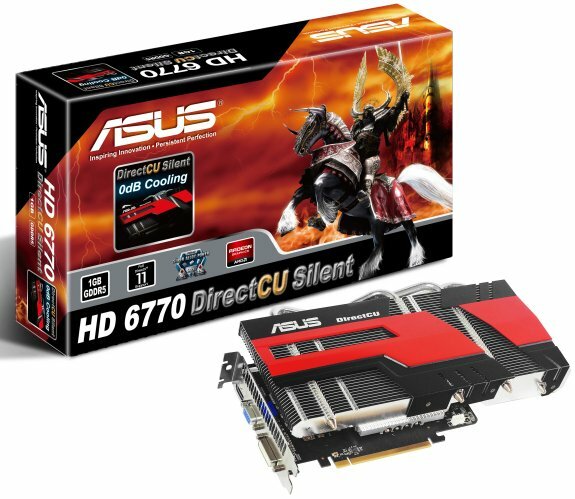 The DirectX® 11-compatible ASUS HD 6770 DirectCU Silent features 800 stream processors and 40 texture units, plus 1GB of GDDR5 video memory. This means it is more than able to handle HD gaming with details and effects set to medium or higher, which was unheard of with previous silent cards. The HD 6770 DirectCU Silent is therefore an excellent choice for consumers who require a quiet computing environment, and at the same time are unwilling to sacrifice potent multimedia and gaming capabilities.